The season of warmer weather is finally here which means more opportunities to wear dresses. It’s also the time that more special occasions are taking place that you find yourself attending and needing something to wear. When I do make a purchase I keep in mind that what I’m buying is a versatile piece that can be worn more than once. I found this pleated dress at Ross and I loved the color and the embroidery of the flowers at the neck of the dress. I really was sold on this dress outside of the great price, but because it had pockets which is always a major win for me, dressed up or down they will always look chic! For my shoes I paired with my denim flowered sandals that I pulled from my closet that went perfect with this dress. 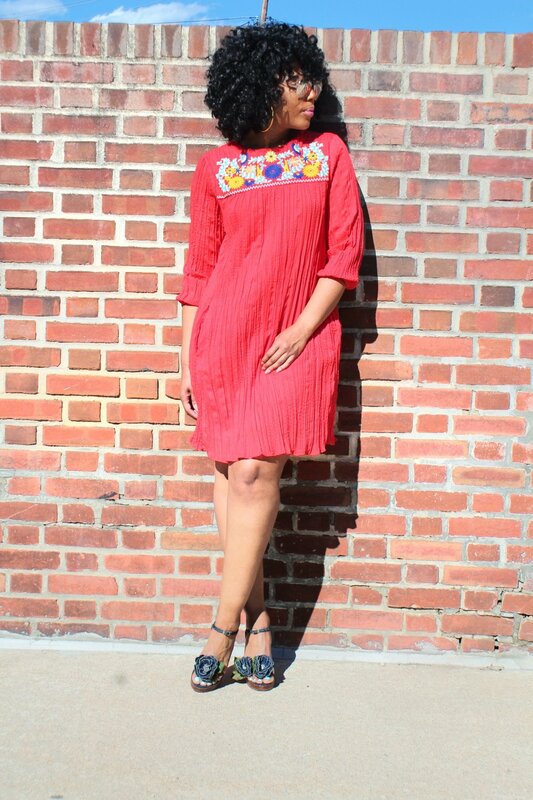 You don’t have to also buy an entire look, shop your closet for those hidden treasures. 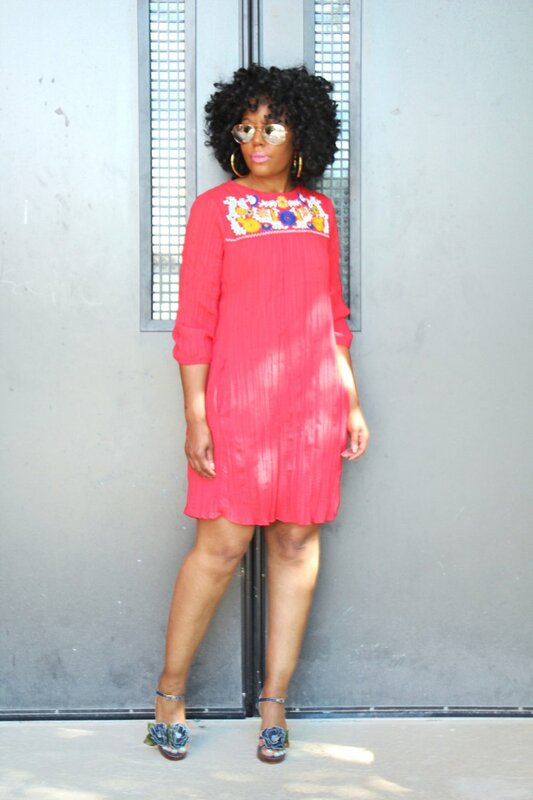 What I love about this pleated dress is that it can be worn for a dressed down daytime look with wedge sandals or flats for a baby shower or even just for a spring day. And it can be dressed up with heels for a date night or evening party. A few great accessories would be a pair of earrings and a clutch bag to complete this look for evening and switch out the clutch for a crossover bag for day time. What’s your favorite way to wear a pleated dress for summer? The color pink has definitely been trending a lot lately and being that it’s my favorite color I’m loving every bit of it. I have been adding color to my looks and totally enjoying it, I have a couple of recent post with wearing pink here and here. Summer is the perfect time to play around with this color and these pants were the perfect addition to my wardrobe. I’m obsessed with denim and I can admit it. They say admitting you have a problem is the first step, right? Well to add to my love for jeans I’m currently loving my flared ones. I think it’s safe to say that many women think they may not be able to pull this look off, but that’s simply not true they compliment all body types. I’m a sucker for a jumpsuit and I could probably wear one almost everyday or at least every other day. They are so comfortable and easy to wear which is a definite plus in my wardrobe book of easy breezy looks. It doesn’t take a lot to style them and I’m showing how I decided to rock this cute little one I have on. I’m so here for this cold-shoulder trend right now, I cant get enough of it. It’s one of those looks that make you look so polished and put together without having to try to hard. Pink was my color choice for this dress, which actually is my favorite color and seems to be the “it” color this season as well. Lately I’ve been gravitating to a lot of blue and white, which is out of the norm for me. Generally I pretty much stick to black and white with pops of color here and there, but this spring and summer I’m trying something different and stepping outside of my comfort zone. For me I believe its a great color that goes well with with neutrals that I can pair it with and it being a peplum top was just the icing on the cake. I love me a great pair of capris, they are so easy to wear and you can pull together your look in no time flat! If you don’t know I’m a huge fan of repurposing the pieces that I enjoy wearing to get the most bang for my buck. These capri pants have been a staple in my closet and will be on repeat during the spring and summer months. I always love it when I find something in my closet that I haven’t wore in awhile and give it a totally different look. This blue and white stripe tee shirt that has only been worn once went perfectly with my favorite drawstring pants that I’ve had forever. Who says you can’t make something old new again when you learn how to reinvent old pieces.